When he looks in the mirror, artist Charles William sees a reflection he often runs from, but one that he is learning to embrace. It’s taken Mr. William, 34, a while to learn what comfort means. For years, he lived on street corners, in shelters and under bridges. Comfort became a patch of shade, a tuft of grass, a sandwich from a stranger. Then he went to the Stewpot, where he learned of the Dallas-based shelter’s art program. Four years later, he is the shelter’s most prolific painter, the artist who has shown how art can help heal. How I got the story: I found this story while exploring the city on my first day in Dallas. I’ve always been intrigued by churches, so I visited each of the churches downtown and stumbled upon an art exhibit in the Goodrich Gallery at the First United Methodist Church. 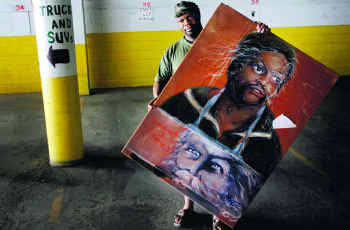 I noticed that the artwork had been created by homeless and at-risk individuals who visit the Stewpot, a local shelter. Wanting to know more about the artists behind the work, I picked up a pamphlet about the exhibit, made some calls and eventually got in touch with the woman who runs the Stewpot art classes. After getting some background information, I asked the director if she could point me to a particular person in the program who had an especially interesting story. I wanted to tell the story of the program through the eyes of a person rather than writing a simple round-up story about it. I’ve always believed good storytelling isn’t so much about places and things. It’s about people.